Taking Liberalities with Central Edinburgh truth – another good reason to vote SNP or Conservative. | Scotswahey! This entry was posted on Sunday, April 22nd, 2007 at 9:30 pm and is filed under Act of Union, British, Britishness, Democracy, England, English, Government, Nationalism, Parliament, politics, Scotland, scottish, Scottish Election, Uncategorized. You can follow any responses to this entry through the RSS 2.0 feed. You can leave a response, or trackback from your own site. 8 Responses to Taking Liberalities with Central Edinburgh truth – another good reason to vote SNP or Conservative. Well abused Liberal Democrat tradition – good to expose this! The Lib Dems’ data is far more honest! They may be slightly out in their pictorial representation of the positions of the different parties but they are in the correct order with the correct percentages attached to them. The SNP figures are just a national opinion poll extrapolated onto Edinburgh Central – they have no basis in actual votes or the opinions of the electorate in Edinburgh Central. The Lib Dems do have a much better chance than the SNP. The SNP have very little support in Edinburgh – they didn’t win a single council seat in 2003. Edinburgh Central has been the Lib Dems’ No.1 target seat for four years and they’ve been putting lots of work into it. Especially in the large areas which form part of the Lib Dem held Edinburgh West Constituency. It’s only the past few months that it has begun to look even almost winnable for the SNP. I hate to say it but -it’s a two horse race in Edinburgh Central. If you want Labour out vote Lib Dem! The Tories and SNP can’t win here. You sound like a Lib Dem machine worker. “Slightly out” is, I’m afraid an understatement. Use your eyes and your brain. People reading Siobhan’s newsletter see the chart and don’t read the percentages. Her chart is pathetically out of scale, trying to gloss it over only irritates me further. Do you really think having bars in a chart in the right order is some kind of validation? You remove any reason that I should believe what you people have to say. I’d be much more impressed if you just owned up and fixed it. I too had noticed this funny thing that both the SNP and the LibDem claim in their election material that only they can beat labour. But well done on noticing that the pic is misleading (ill go and check presently). 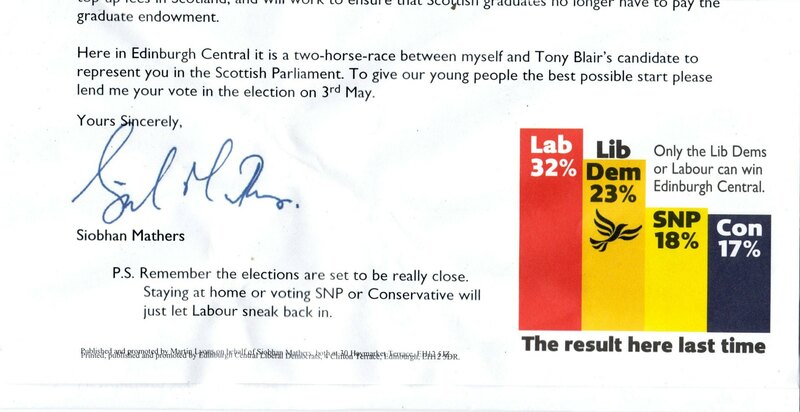 Siobhan Mathers is also writing letters to SNP voters claiming the SNP have given up trying to win Edinburgh Central and as such are telling their own voters to vote lib dem in order to get Labour out! Can you believe this dishonesty from this woman? How dare she deceive SNP voters like this? Every dirty trick in the book she is trying. And Lib Dems make themselves out to be squeaky clean! What hypocrisy! I’m so glad someone else has noticed the stupid ‘graph of lies’! I’ve been fuming about it for about two weeks! I’m not saying that she shouldn’t be able to stand for election or anything like that, but I do think voters have a right to know. I’d be pretty pissed off if the candidate I voted for won and then had to hand over to someone else for a good six months. Also, the ‘two horse race’ thing is a well-know Lib Dem tactic. They used to do it (probably still do actually) in my parent’s constituency and I’ve heard of them doing it in other places too. For a party that is supposed to believe in proportional representation, scaring folk into voting tactically is a total contradiction. Oh well, it is the Lib Dems after all…that’s what they do. I’m sorry you think my graph is misleading. They are not intended to be eye-catching rather than misleading. The results used are from real elections and clearly mark the percentages of the vote polled by each party. I really don’t think anybody, who having initially taken the time to look at the graph, then fails to read the percentages.